In the wake of Manchester City’s record-breaking claim to the Premier League, The False 9 will look back at some of the greatest club sides to ever win the top tier of English football. Studying tactical nuances and squad strengths, the articles in this series will consider some the famous campaigns which led teams to glory. WHEN Bob Paisley retired in 1983, having amassed twenty trophies in just nine seasons, the next man to take on the Liverpool job had a very large pair of shoes to fill. Joe Fagan, who had been assistant manager to Paisley since 1974, was the club board’s first choice to become his successor. Fagan, who had been a key figure in the Boot Room since its inception, was initially reluctant. One year later, with the league, the League Cup and a European Cup under his name, any apprehensions were forgotten. Fagan’s glories in his first season as manager were not easily gained. Under Paisley, Liverpool had been dominant in the league, winning six division titles, alongside three European cups and countless domestic cups. Yet Fagan’s tenure was not simply a copy of Paisley’s style; nor had he simply taken over a world-class team. Roy Evans, one of the key coaches under Shankly, Paisley and Fagan, said: ‘The cynics said he’d simply inherited the treble winning team from Bob Paisley (…) What a load of rubbish (…) It was typical of Joe that he answered his critics in the best possible fashion.’ The Liverpool team of the 1983/84 season was a development from under Paisley, and the illustrious honours proved that it was a successful one. Liverpool would finish the season as champions, taking 22 wins, 14 draws and six losses. At the time, 22 was the joint lowest win rate with which Liverpool had won the league, equal to their victory in 1921/22. Conversely, six match defeats had been their lowest loss rate since the 1978/79 season, when they only lost 4 and took the title again. Liverpool had the least amount of defeats and also conceded the least amount of goals in the 1983/84 season. Whilst these stats suggest that Liverpool played more conservative football under Fagan, certain match score-lines suggest otherwise. The Reds would ultimately beat West Ham United and Luton Town 6-0, and Coventry City and Notts County 5-0 during the season. Ian Rush won the golden boot with 32 league goals, scoring 47 in all competitions. Rush became a key figure in the side, always searching for the final ball. Whilst Liverpool struggled against league contenders Manchester United, drawing 1-1 at Anfield and losing 1-0 at Old Trafford, the Reds would eventually finish the season as champions by three points over 2nd place Southampton, and six points clear of Manchester United and a resurgent Nottingham Forest. A 0-0 draw with Notts County in the penultimate match was enough to seal a third successive league title for Liverpool. The season was one of inconsistencies, particularly marked by a shock 4-0 defeat away to Coventry City in December. In their last six games, the Reds won two and drew the rest, and their margin of victory looked slim. However, with arduous cup competitions also drawing on their strength, Liverpool were able to squeeze out the league wins when they needed them, even if it saw them drop off at other times. In these other competitions, Liverpool especially proved their might. The Reds stormed to their fourth European Cup final to eventually beat AS Roma on penalties, losing no games and only drawing one in the process. Meanwhile, a replay victory over rivals Everton secured the Reds their fourth League Cup. 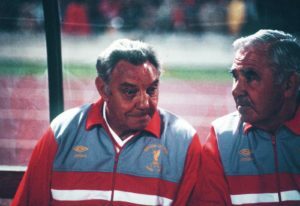 Fagan had put the lid on any doubters, and winning the treble meant that Liverpool remained perhaps the strongest club side in the world. On paper, Liverpool lined up in a 4-4-2 under Fagan; in the matches however, this changed dramatically. Bruce Grobbelaar was the first-choice keeper, and a back four of veteran Phil Neal, Mark Lawrenson, Alan Hansen and Alan Kennedy rarely changed either. Ronnie Whelan, who had featured as left-midfielder in seasons before, was injured for the first half of the campaign, leaving the Reds without an orthodox winger. Australian national Craig Johnston or utility player Steve Nicol typically took Whelan’s place on the left flank, fulfilling his role. Captain Graeme Souness patrolled the centre of midfield, a dominating figure who could shuttle from box to box; John Wark, who joined the side in early 1984, could play a similar role. Sammy Lee and Craig Johnston, Liverpool’s more creative midfielders, often switched wings or drifted into the centre, always searching for the ballMichael Robinson, signed at the beginning of the season from Brighton, played up front with Rush for the standard centre-forward pairing. Meanwhile, Kenny Dalglish, chiefly renowned for his goal-scoring prowess, instead dropped back in the hole behind them when attacking, creating a 4-3-1-2. When Whelan returned to the side at the start of the new year, Liverpool returned to their 4-4-2, although Dalglish remained slightly behind Rush, looking to provide the killer pass. King Kenny, now 33, lacked the pace and quick turn of his younger years and consequently missed certain matches; instead, his fantastic vision and ingrained work-rate helped the Liverpool side to tally up 73 goals in the league. The Liverpool team under Paisley were renown for their build-up play, defined by the manager in his own concise way: ‘You pass the ball to another red shirt and then take up another available position.’ This ‘pass and move’ style was continued under Fagan, with players always looking to create space and provide an opportunity for the pass. When recycling play, the Liverpool defence and midfield would create triangles, waiting for a better chance for an incisive ball. With Hansen and Lawrenson starting most games, play began at the back; Lawrenson was a converted midfielder and Hansen had an excellent passing range, meaning the two were comfortable in possession. The two could collect the ball from Grobbelaar or after sweeping up an attack and look to distribute out. Phil Neal and Alan Kennedy, the full backs, always moved high up the pitch under Fagan, looking to support the midfield. Neal, noticeably, could drift into central midfield to create a player to pass to. Often, this possession play was to lure opposition players in, creating gaps for others to run into. Liverpool’s midfield, with Souness, Lee and Johnston, could transition from short passes to long, fast balls for Rush or Robinson to search for. Lee and Johnston often sprinted across the pitch behind the strikers, swapping places to pull the defence apart; Johnston, playing in the centre, was particularly adept at losing his marker and remaining mercurial. The absence of a left-footed left-midfielder saw balls on that flank taken wide and turned back, Nicol or Whelan looking to cross or play a diagonal ball back into the centre, before charging into the box. Whilst Liverpool could drive wide and hit in a cross, it’s clear that Fagan’s side preferred playing linear balls over-the-top or between the gaps. Resultantly, Liverpool were deadly on the break, exploiting the pace of Rush. Liverpool played a very high defensive line under Fagan, with Hansen and Lawrenson moving towards the halfway marker. Whilst this worked well as an offside trap against certain teams, Liverpool were often caught out by the odd fast ball. Usually, the whole team would move to the centre of the pitch, looking to crowd the midfield and force the opposition out wide for the fullbacks to harry. Interestingly, there are comparisons to be made between the gegenpress found under Klopp and the way Liverpool closed down under Fagan. If they lost the ball in an attack, Rush would press the back line, much like Roberto Firmino, looking for a defender to make a mistake or clear it in a panic. Dalglish and Johnston meanwhile would look to cut off a potential pass to the midfield by closing passing lanes. The Liverpool side of the late 1970s and 1980s looked to suffocate the match, either with their possession play or physical defending. The Liverpool side under Fagan may not have been a direct continuation of the Paisley team of before, but they kept up the tradition of winning. Fagan silenced his detractors, becoming the first English manager to ever win the elusive treble. Whilst the next season would take its toll on Liverpool; the team won no cups, and their European campaign was overshadowed by the tragedy in the final, as 39 Juventus fans died when part of the Heysel Stadium collapsed. Fagan retired in 1985 a broken man. Yet, in only two years as manager, Fagan found himself undeniably placed in the Reds’ golden history, one of the greats to ever manage the club. 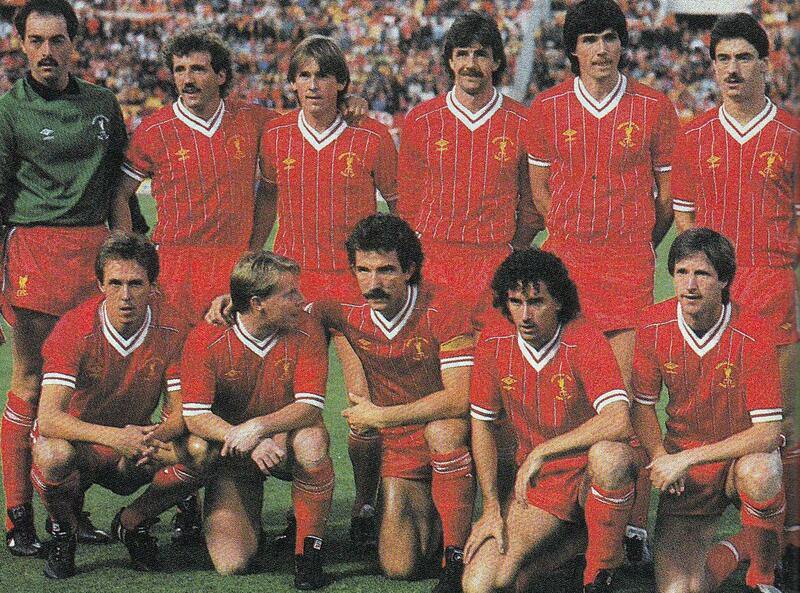 The 1983/84 season, under his reign, may have been the Reds’ best ever.